Smartphone cameras can be fantastic, making it easy to fix images on the fly, edit or filter them and then share them with others. The one thing that they really can't do well is zoom. Sure, you can zoom in on something digitally but the results tend to be poor and grainy... and smartphones tend to have pretty poor flash capabilities too. On the other hand, digital cameras can do a lot of clever things with zoom lenses and usually have bigger sensors leading to better images, but the software tends to be limited and often rather difficult to use. So instead of trying to choose… why not have both? The Samsung Galaxy Camera (announced in August 2012) tried to do just that. Essentially, one side was a Samsung Galaxy S III and the other side was a compact Samsung digital camera with a 16 megapixel camera with a 21X zoom lens with a big 23mm aperture on it, all designed to give superior pictures over a smartphone. Surely Samsung would be on to a winner with this? Well, there were a couple of problems. Firstly, this was a bulky device at more than 300 grams in weight and about 35mm thick where the lens was. So, a bit big for a phone… but apparently it was a bit so-so as a camera as well. Despite the unique charms of the device, it never really sold well. 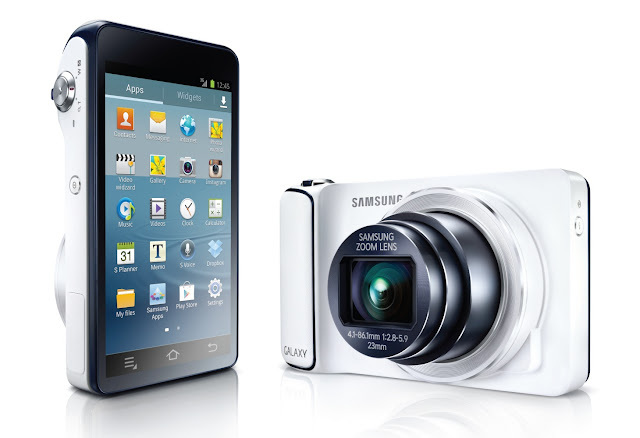 However, Samsung stuck with the idea and launched the smaller Galaxy S4 Zoom and the high-end Galaxy NX in 2013, and both the Galaxy Camera 2 (without any cellular connectivity) and the phone-based Galaxy K Zoom in 2014. Other manufacturers tried the same thing, for example the Panasonic Lumix Smart Camera CM1. All met with similarly cool responses from consumers. If you don’t mind being stuck with Android 4 then you can pick one of these interesting devices up for a typical price of around €160. There’s not currently anything quite like it on the market, so if you are prepared to put up with its limitations then it could still be fun.